One of the most fulfilling elements of design for me is curating a tablescape and then seeing people sitting down at that table to enjoy a meal. When this happens, my first thought isn't, "Will they notice that upgraded flatware?" or "I wonder if they'll appreciate those calligraphy place cards." It's actually, "I hope this table makes these guests feel warm, and comfortable, and joyful." 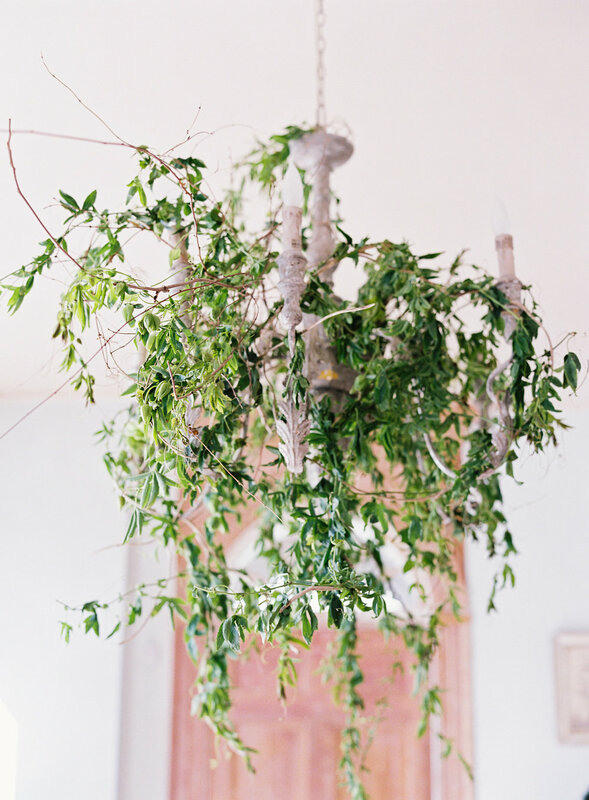 Today I'm sharing some behind the scenes photos from the first workshop I designed and styled for Michael and Carina Photography (and all of these photos are from them!) One of my favorite aspects of a Michael and Carina workshop is the welcome meal, which, in our past two workshops, has kicked off with a champagne toast. 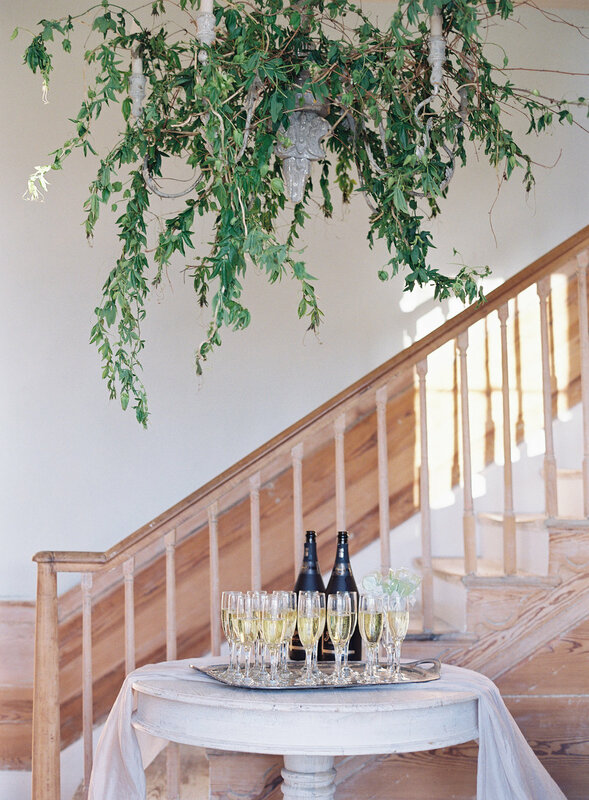 Genevieve from La Fleur du Jour and I worked together to design the dinner table, and she also hung a small forest of greenery from the entryway chandelier to create more of a statement. From a design aspect, we were lucky to hold this workshop at such an inspiring venue (and we chose the venue for that reason). Filled with special trinkets and plentiful styling pieces, The Retreat at Cool Spring is a stunningly curated house-turned-inn/venue. I only brought in some minimal centerpiece items for our table here, juxtaposing my finds with some antique books already in the house, and a grapefruit from the kitchen. Even the table itself was a gloriously heavy, weathered wood piece, full of personality and character. I wonder how many meals have been enjoyed there? The Locke Store catered all of our lunches and this welcome dinner, and their farm-to-table food was delicious and bountiful. (I was able to bring home a huge box of assorted salads afterwards, which lasted for days.) At the risk of sounding like my holiday self, I still crave that rustic fruit tart. 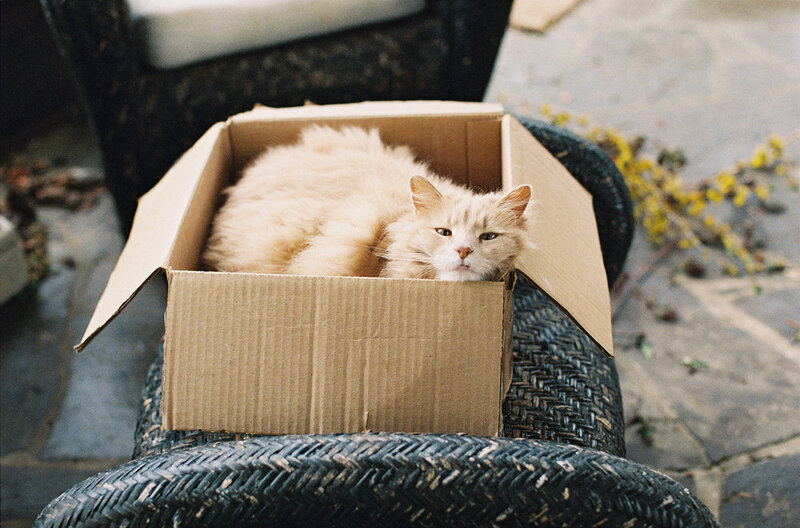 Oh, and that cat who lives outdoors at the Retreat and enjoys boxes like all cats, ever? Her name is Richard.